Tom T. Hall was often referred to as 'The Story Teller' because of the number of ballads that he wrote and often recorded. Some were hilarious and yet they had deep meanings with-in them. 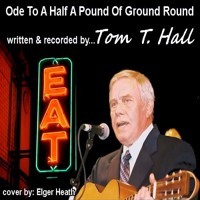 'Ode To A Half A Pound Of Ground Round' seems like a frivolous title for a song and,true enough, it was as funny as all get out but it speaks to the desperate thoughts that go through the minds of most folks when cash runs out and we have no choice but to go hungry. This is my simple cover of Tom T. Hall's 'Ode To A Half A Pound Of Ground Round'.